Last night at the track was Brick Night, so rather than kill ourselves just running fast we killed ourselves running fast off our bikes. I’m sure we were a sight to see on our trainers in the grass, changing shoes quickly, and taking off running. It was good practice and good fun though. It’s much easier to catch up with training friends while spinning – I’m far too heavy of a breather to talk while running – and spinning goes way faster while chatting it up as opposed to watching the morning news. The workout was a 1/2mi warmup (run), 20min spin (bike), 1mi fast (run), 15min spin (bike), 1mi fast (run). The spinning was a total sweatfest, I hit my first mile in 6:45, and the second mile in 6:49. I couldn’t have held on to the run pace for another 400meters even if someone had bribed me with a Whole Foods Berry Chantilly Cake, but I felt pretty able to hang on to the pace for a mile and forced my body to keep form despite screaming burning lungs. A mile is a good distance to run off the bike. The first 400 your legs say “eff you get me back on the bike NOW’. The second 400 you realize you’re probably running too fast. The third 400 you curse yourself for running so hard. And the last 400 you’ve succumbed to the fate of dying via the run. But as soon as you’re on the bike you forget the pain and want to do it again. Next time I want to run 3 miles/sessions off the bike, and I want to run faster. 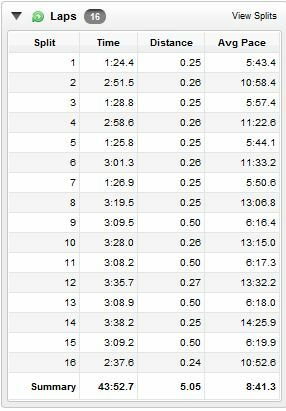 My legs weren’t so fresh from Monday’s 40miles (bike) + 1hr @7:47min/mi pace and I think that I could do better. 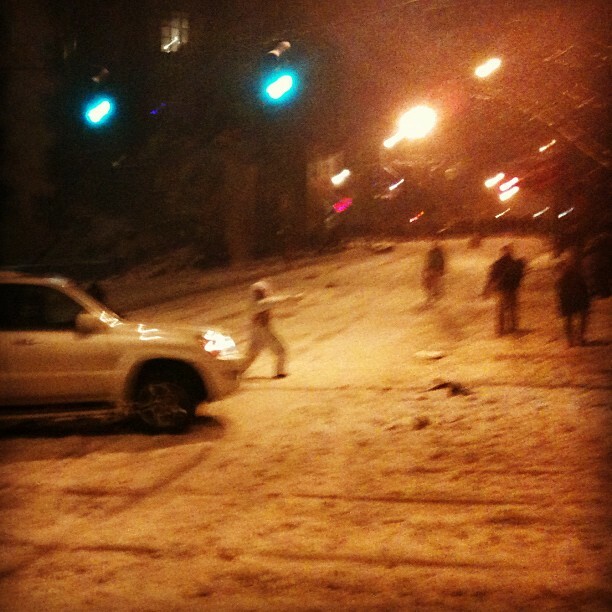 Is that a bunny redirecting traffic for sledders, you might ask? Why yes, it is. Back to the track. Tonight’s session was 12×400’s, with a 200 slow jog between, and a treat between 4/5 and 8/9 where we were gifted with a 400 jog. And by “we were” I mean “I was.” My usual partner in track crime was sick tonight, and the other member who showed had a different workout and was gone before I could even make small talk. The workout went well, a good thing because I sort of needed it to. Sometimes the progress that I’ve made and the work I’ve put in, no matter how great, aren’t enough to keep my mind quiet. Sometimes I need a moment in time to clearly map to improvement and sometimes I need to exceed my own expectations. I haven’t talked too much about my knee online but it’s been bothersome to me; injury has a tendency to make my confidence drop. I went into the run tonight not knowing how hard I could push myself or what to expect, having run only once since my 10k race last weekend. I wouldn’t claim to have gutted myself, but I pushed myself hard and feel good about the fact that I hit my pace goals with plenty of juice to spare fresh off a week of lacking confidence and nearly no time on my feet. Lots of runners and triathletes are data nerds. Counting laps, miles, heartbeats, and calories, all while doing math on the go to make sure they’re hitting pace for any given workout and distance. They calculate training sessions, intervals, sleeps ’till the next race, and how many cups of coffee it takes to complete two-a-days factoring in sleep lost from said two-a-days. How many clean sports bras or suitable pairs of socks one had left until laundry day is also included in the massive jumble of numbers, and I very much participate in that last triathlete/laundry goddess story problem. I try to simplify my focus during training, only because I know that I do better with a plan that doesn’t require having to count and calculate on the go. I do have my own compulsive counting habits, for example, for the last 10 lifts in a set of weights you MUST count down from 10, not upward to the total. MUST. Otherwise you did not properly celebrate being done. When I’m trying to keep a certain cadence on the bike trainer I find that counting does help with keeping a rhythm. And of course when I’m running 800’s after the first lap I’m thinking, “One more lap. 1/2 of a lap left. 1/4 of a lap ’till you’re finished! And then you get to run 3 more you lucky girl!” But I count to keep myself entertained and focused as opposed to constantly re-calibrating what’s happening with every stride. I’m getting more in tune with my heart rate, but luckily I don’t personally have to count 186 beats in a minute while I’m trying to run a 1:26 400, I have a lovely Garmin monitor to do that tiring job for me. I always thought I didn’t need another thing to focus on, but heart rate is a measurement that I now push upon others. It’s just so helpful to measure my capabilities and what my body can maintain. Sometimes it does scares me off too, like for example when it misreads and tells me that I’m at 200 beats per minute when I’m jogging slowly downhill, but I’m also learning by breathing, feel and pace when it’s mistaking me for someone who can actually get their heart rate that high. I sort of count calories, but not really. Only in a how many gu’s do I need on this run sort of sense, taking into consideration how much did I really eat last night?. Then I come home and calculate how many nuun’s will be required to replace the sodium lost from sweat, and that answer is always A LOT OF THEM. Look how pretty it all looks! 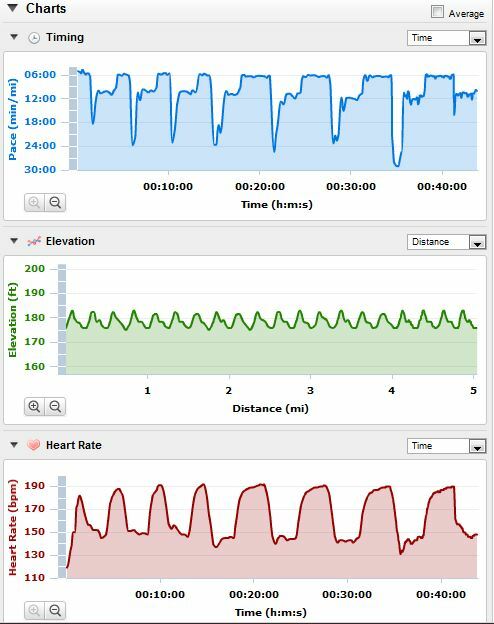 Unfortunately I can’t take credit for the cute little rolling hills in the Elevation category, but the plateaus in Pace and mountains and valleys in Heart Rate were created by yours truly and her running brilliance. Apparently data art is the next big thing, so I’m thinking I should probably reconsider my career and become an exercise data artist. Right? Wallpaper? Greeting cards? Large scale wall coverings? Needlepoint? I’ll just run around, capture my data, and print it on anything you can think of. Truly though, sitting on my couch post run these pretty graphs are making me much happier than is really appropriate. Some of the sets were hard, and some of them were REALLY FREAKING HARD, so it’s reassuring to see that the data doesn’t read normal, normal, normal, OFF THE CHARTS DEATH. And we all know, numbers don’t lie! Tonight’s track session was not the best ever. I averaged a 4:57 per 1200; 4:50 should have been easy and on a good night I would have come in under that target for each split. I may not have been that off time-wise, but I feel very off physically. I didn’t have it in my body to push any harder. My lungs were burning and my legs hurt, but honestly they weren’t even all that done for. They just also didn’t have anything left to give. It feels like my body is accustomed to going and going and going some more, and always comes up with the energy to put one foot in front of the other, one more time, again and again. Tonight it was storing that energy and wouldn’t trade it in, because for whatever reason going fast wasn’t worth the cost and the risk. Body! Get with the program! Fast is good! 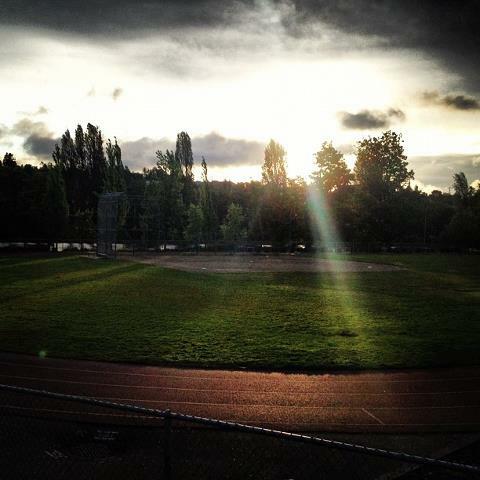 On my warm up I was running in the dark along Green Lake thinking about how hungry I am to race. I was feeling glad that I signed up for the Seattle Half and inspired to give the next few weeks my all and race the course and other runners. Thinking about it all I felt really hungry for the challenge, and I started to think about ways to keep reaching for the next few weeks. Things to focus on to call up that feeling in case I forget. Well, now I know I’ll stay hungry for at least one more week. 1200’s, we’ll meet again. And hopefully soon. Be afraid.